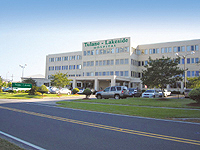 Our facility, services and dedicated staff are proof of Tulane-Lakeside Hospital's commitment to our patients. Since opening in 1964, Lakeside Hospital has delivered over 90,000 babies and treated well over 300,000 patients. Tulane-Lakeside Hospital's commitment to treating women and their babies has grown by expanding services and offering a wider range of healthcare options for the entire family. For over 40 years, Tulane-Lakeside Hospital has provided the knowledge, expertise and specialized care vital to the healthcare needs of women and their babies. In July, 2005, Tulane University Hospital & Clinic merged with Lakeside Hospital to become a leading teaching facility in the community. We provide cutting edge technology in many specialties including Obstetrics/Gynecology, Urology, Radiology, Ophthalmology, Otolaryngology(ENT), and Surgery. Tulane/Lakeside Hospital is located in Jefferson Parish. Wrapped around New Orleans, a mystical city steeped in history, culture and night life is Jefferson Parish - a place rich with a heritage all its own. Nowhere in such close proximity will you find such cultural diversity, as you will in Jefferson Parish. Truly a sportsman's paradise, Jefferson Parish abounds with recreational and nature watching opportunities; just 15 minutes from downtown New Orleans. You'll find some of Louisiana's most picturesque wetlands and a true slice of Cajun life. Enter a world of timeless beauty amongst moss Cypress trees on a popular swamp tour. Catch a glimpse of an alligator on the prowl or depending on your guide, you just may catch more than a glimpse. And if catching fish instead of gators is more your style, charter a fishing boat from many of the local marinas. The waters that surround Jefferson Parish are home to hundreds of species of fish. It will soon become obvious why Jefferson Parish boasts some of the top fishing spots in the United States. Some of the oldest fishing rodeos in the country are held annually in these waters. Try your hand at a prizewinner or just sit back and enjoy the excitement. If fishing isn't your game, these same areas are among the best bird watching spots in the nation. Bird enthusiasts will delight in the great number of species that grace the landscape. In fact, Queen Bess island off the coast of Grand Isle is the nesting site for the once almost extinct brown pelican, Louisiana's state bird. Another interesting bird sanctuary is that of the purple martin. Year after year, they flock to the beautiful shores of Lake Pontchartrain for their annual nesting ritual. You can also enjoy the sights of the lake as you stroll along Linear Park. Or, if you are up for a little more action, roller blading and bike riding are also popular activities. For fitness or leisure, parks throughout Jefferson Parish can accommodate just about any past time. Water sports abound on Lake Pontchartrain as well as the many other waterways that channel Jefferson Parish. Boating, sailing, jet skiing, and water skiing, are not the only activities. The beaches of Grand Isle along the coast of the Gulf of Mexico offers swimming, fishing, crabbing, picnicking, even camping. And if camping on the beach is a little too primitive, Bayou Signette state park offers quaint cabins nestled in the natural beauty of Louisiana's swamp lands. Or spend the night in style at an elegantly appointed Victorian Bed & Breakfast tucked away amongst stately oak trees. In fact, Jefferson Parish has accommodations to suit every taste and budget. You will also find activities for the entire family in Jefferson Parish. Spend the day shopping at one of the area malls, with shops sure to suit any style. Take in a movie at one of our multi-screen theatre complexes. Or catch a little more action at one of the area casinos where you can dance, dine, and gamble the night away. Sporting and cultural activities go on year round in Jefferson Parish. For a day of All-American family fun, take in a ball game at Zepher stadium, home to our very own professional baseball team. Or take a front row seat at the Alario Center for world class sporting events. The Jefferson Performing Arts Society offers a variety of classical, contemporary, as well as original theatrical productions sure to entertain the entire family.